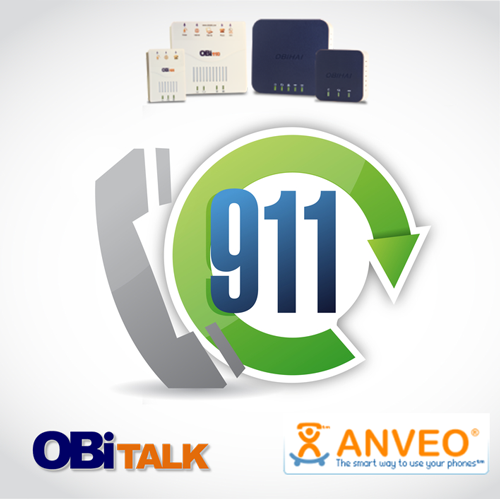 The OBiTALK portal and Anveo service can get you set-up with 911 calling on your OBi for just $15 / year. - No Need to Configure the OBi Manually! - E911 with Alerts: Alert you or another person whenever 911 call was placed. 911 Alerts can be automatically sent using Email, SMS/Text Message, phone call. All you will need to do is select the "Anveo E911 Sign-Up" button on your OBi's Device Configuration page in the OBiTALK web portal. You will be prompted to select an unused Voice Service slot with which to configure the Anveo E911 service. You may only select a service slot which is not currently being used with another VoIP service. After this, you will be redirected to Anveo's web site to verify your home address and complete the sign-up. As long as everything is in-order, your OBi will be automatically configured for emergency services calling.